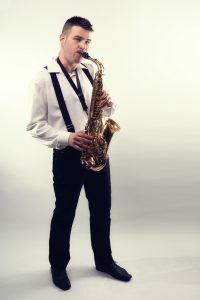 My name is Nikolay Uzunov and i am a saxophone player for the last 20 years. Because of my Surname most of the people call me UZO, and so this is my stage name. During the years of playing music i made a lot of different things with many people in different groups and playing different styles of music. Lately i am playing more Club Dance Music like Deep House, Vocal house etc. , but i also play with many musicians as duo, trio or bigger bands and all is up to the event. If you want to have interesting and fresh party – not an ordinary one – You can always count on me. Feel free to take a look on the services i provide in the menu above. If you like something, but you have an idea how it will be more special – just share and let’s make it! I wish you all the best and if you have any questions – just drop me a line or call me.